Travelers always sleep on Salt Lake City, for reasons that cease to make sense once you’ve actually visited. After spending a month living and working in Mormon Mecca this year, I am here to tell you that Salt Lake City cannot be beaten for living your best life on a budget. For me it began each morning watching the sun rise over the Wasatch Mountains and, each night, as I walked home in the warm desert air, watching the light dip and fade over the Great Salt Lake. Like the locals, I never grew tired of the view -- though I’m sure my friends in New York and London thought my daily #sunsetgoals Instagram posts got a bit braggy. But that’s what happens in Salt Lake, perhaps the biggest city in America that you can feel you’re discovering for yourself. The sheer abundance of the free-to-enjoy nature, the low cost of food and housing and, well, just about everything, and some of the best skiing on the continent makes for a must-visit destination. And yet it’s still relatively pocket-sized: At noon you can be careening down ski slopes that overlook the downtown gastropubs where you’ll be sipping beer at 1. This should be the year you find your way to the high-key snow and the low-key scene. 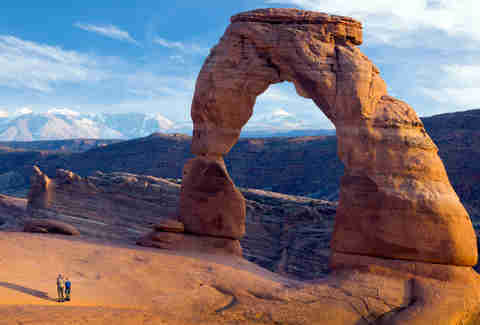 Here’s why you owe yourself a trip to Utah’s capital. You’ll notice Utah’s license plates lay claim to “The Greatest Snow on Earth,” at least when they’re not covered in snow. It’s one hell of a boast, but science says hear ‘em out. Downhill skiers favor a particular kind of middle-wet snow that blends the better qualities of dry powder and heavier snowpack. 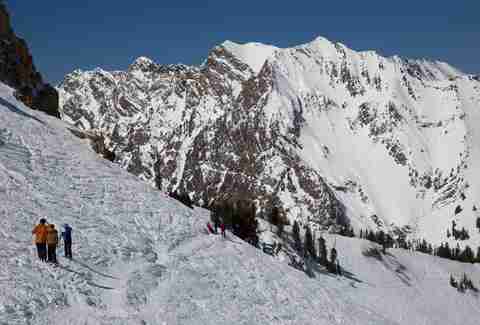 As storms move east from the Pacific, through the mountains, and then across the Great Salt Lake, the conditions align for huge dumps of perfect snow to absolutely plaster Salt Lake City’s ski resorts. Of which there are no fewer than 11 within an hour of the airport, four of which are world-class. So from November to April, these are your alpines. Brighton, a local favorite, offers night skiing till 9pm for those keen to take their lives in their hands. To save a few bucks find a slightly more remote option like Powder Mountain or Sundance. Sundance also offers a twilight pass which allows you to ski 2:30-9pm for only $49. To find discounted tickets at multiple resorts, locals use a site called Liftopia. Living by the University of Utah campus offered me panoramic views of the city, but drive just a few hours south of the city and you’re in perhaps the greatest concentration of spectacular parkland anywhere in the world. Bryce Canyon, Arches, and Zion are among the top national parks in America, and all are less than five hours’ drive from downtown. For a quick overnight in Zion try the Big Yellow Inn in Cedar City offers rooms for under $100 just one block away from the annual Shakespeare festival. For a treasured piece of Americana, the Lodge at Bryce Canyon plops you squarely in its eponymous national park. Built in 1924 using local materials, the lodge offers unrivaled access to the park’s renown red rock formations and pine forests. Stargazing here is spectacular, not to mention free, and especially fun when followed by a sit-down by the lodge’s stone fireplace and a deserved whiskey or three. Dine out in style every night like some lunatic oil heiress. You know Mormons aren’t big on alcohol, smoking, drugs, or a bunch of other vices that don’t count when you’re on vacation. But consider their effect on Salt Lake through a different lens. 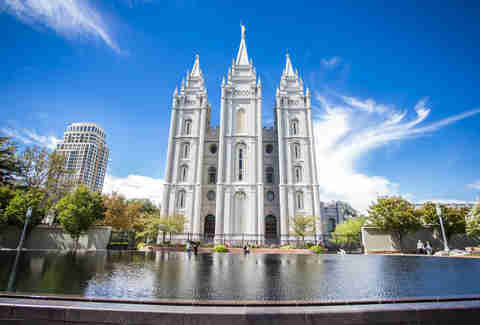 With 60% of Salt Lake City belonging to the Church Of Latter Day Saints, most of the folks you meet are required to tithe a tenth of their incomes. You, a non-Mormon, still find prices set for people feeling that cash pinch. That puts the city in a comparable cost-of-living range as the likes of Tulsa and Jacksonville. If you decide you want to stick around? Unemployment’s right around 3%, some of the lowest of any metro area in America. 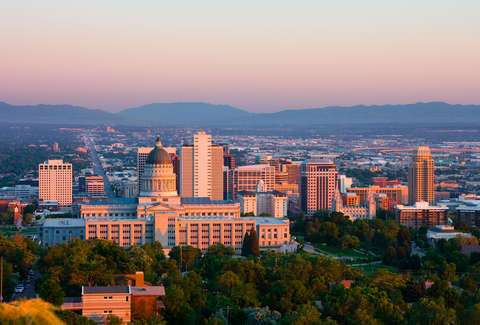 Tech startups have earned the region the moniker Silicon Slopes. There’s work here, and your paycheck will go a long way. One slim Hamilton is also the going rate for a great mid-range dinner in SLC. Forget ordering Seamless; instead, dine out in style every night like some lunatic oil heiress! Ten bucks at Curry Fried Chicken gets you an Indian feast: curry, rice, salad and naan. Blue Lemon in Cottonwood Heights is famous for their slow braised short rib sandwich (big enough for two). That’s all of $9. For the full experience, head downtown one afternoon to the old Union Pacific train depot and spend the day munching and sipping along Historic 25th street. Start at Roosters Brewing Company with a beer and coffee combo created in collaboration with local coffee company Daily Rise. 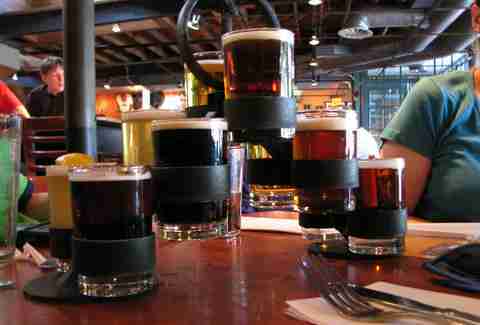 Beer tasters there are $1 a pop, and at brunch a mimosa or Bloody Mary will set you back $2. Need some carbs to offset the booze and caffeine? Head to Pig & A Jelly Jar for $12 chicken and waffles. For dinner try Sonora Grill, one of the best Mexican kitchens in the state, where you get a free entree just for signing up to their mailing list. For dessert, find your way to the Sugar House neighborhood and hit up Harbor Seafood & Steak Co. for their sublime creme brulee pound cake. 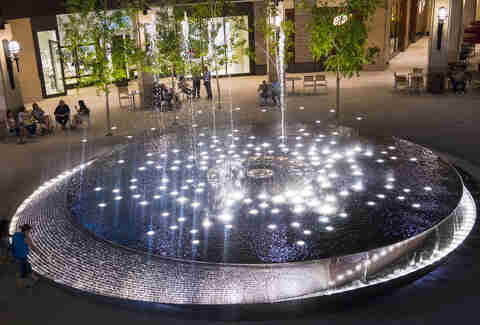 The culture might be the best in America for a city of its size (just 1.1 million). Salt Lake proper boasts a ballet, an opera company, and a symphony, as well as the Pioneer Theatre Company, which Sting last summer chose as the first regional company to present his musical The Last Ship. The Utah Symphony offers an “After Dark” series, wherein musicians bring classical music to local bars and restaurants, resulting in a front row symphonic experience for only $10. They also admit anyone under 30 to concerts for the student price of $10. I would’ve plunked down $22 for an Oscar de la Renta dress if only I hadn’t been eating so well I couldn’t zip the bloody thing up. Yes it has Apple stores and Starbucks galore, but Salt Lake City manages to maintain a thriving small and independent shop scene that, again, will have you spending far less than what you’d expect. Take for instance Decades, a vast museum-like antique clothing store with prices that you cannot believe are real. Their vintage spans from the 1880s to the present day, with some real finds: the most expensive item I saw -- a whale-boned corseted Victorian jacket, $90 -- I bought in a heartbeat. I also snagged two mint-condition 1940s women’s suits in mint condition for $60 total and would’ve plunked down $22 for an Oscar de la Renta dress if only I hadn’t been eating so well I couldn’t zip the bloody thing up. Also outstanding for vintage and up-cycled fashion, is Ironoclad, a wallet-friendly hipster mecca selling “previously rocked clothing,” artisanal crafts and festival gear. Call before you go though, as a sign discloses that business hours are apparently determined by the mood of the shop cat. 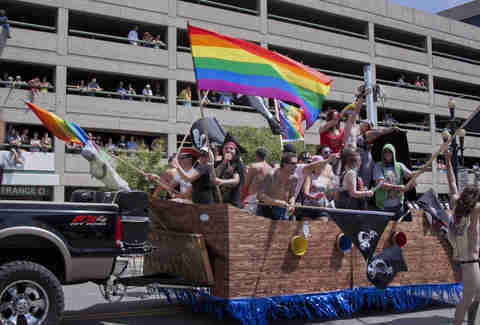 Almost one of every 20 people in Salt Lake City identify as LGBTQ. Anecdotally many of them are people who have left the Mormon Church and gravitated to the city. But Utah was also the first state to pass a comprehensive anti-discrimination law in 2007, making Salt Lake City a protected place. Salt Lake’s first openly gay mayor, Jackie Biskupski, took office in 2016; she recently married her partner at Millcreek Canyon, which is basically in the backyard of the Mormon Temple (and just an excellent wedding spot). You can take in LGBTQ movies during the Utah Film Center’s annual Damn These Heels festival, and the city also hosts an annual transgender conference called Genderevolution. Fancy getting a little buzzed, but on a budget? Let the altitude be your friend. At more than 4,000ft above sea level, everyone becomes a cheap date in Salt Lake City. (Something I learned the hard way.) Bars to sample include The Bayou, with more than 300 beers on the menu (the largest selection in the state) at an average price of $6. If you want to hang with local musicians or actors breezing through town, grab a drink try The Red Door which specializes in $8 martinis and live music. Copper Common serves up classic cocktails in a sophisticated setting that includes a gleaming copper bar. Try its Rosie the Riveter, a tangy blend of sloe gin, ginger liqueur, rosemary, grapefruit and lime. 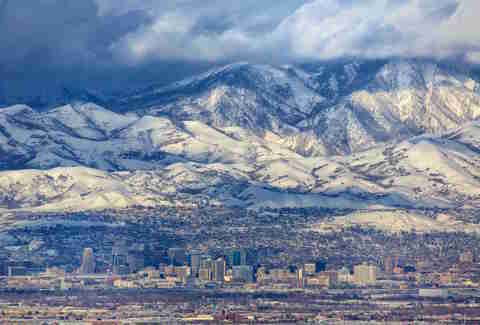 Like so many great things in Salt Lake City, it’s cold, refreshing, and will set you back just ten bucks. Ruthie Darling is a British writer and flagrant fashionista based in Brooklyn and a contributor to Salon, Hello Fashion Monthly, Boro Magazine and Bushwick Daily. On Instagram, she’s @ruthiedarling.